How often do you find a new product on the market that really excites you? 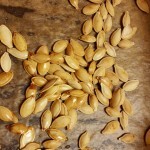 It’s been a while since I came across something small, simple and affordable that instantly made life easier in the kitchen, but it happened a couple of weeks ago and I’m keen to share news of it with you. 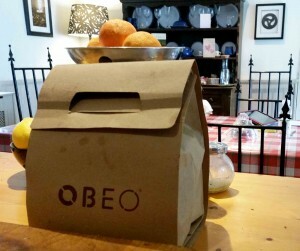 I stumbled across OBEO® in the huge marquee at Bloom in the Park recently and along with many other shoppers, was offered a couple of trial boxes to try out at home. 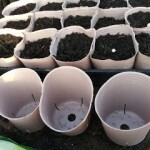 Having now composted both boxes I can’t wait to get my hands on more. Since we began composting I’ve tried several different types of buckets, bins and bags to collect the kitchen food waste, before tipping them onto the compost heap. Some have been more successful than others but all have been a bit fiddly or a bit slimy or smelly and most have attracted flies. This generally results in someone, on occasion, not bothering to flip the lid, but instead firing the coffee grinds, orange peel or tea bags into the refuse bin and not into the compost. 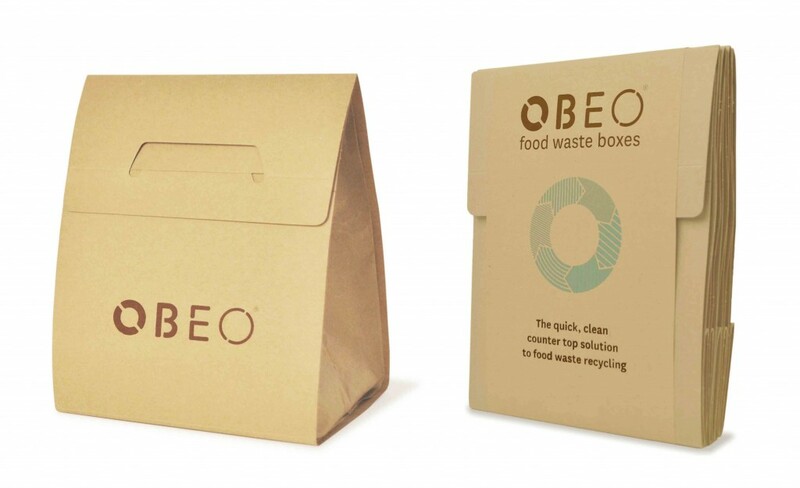 The OBEO®, a small Irish business’ solution to our kitchen food waste problem, is essentially a water-resistant brown bag enclosed in cardboard which can be closed in between use then when full of food waste, fired in its entirety into the brown bin or onto the compost heap. There are diagrams on the back of the bag indicating what should or shouldn’t be put into it if it’s going into a brown bin – handy if you’re new to separating food waste, and a foldable cardboard handle that tucks the box closed when not in use. Due to careful shopping (we menu plan and write a weekly list, a necessity when the closest shop is an 8 mile round trip) and feeding animals, we don’t have very much food waste so it took around five days for us to fill our OBEO® with grinds and scraps. During that time there were no flies or bad smells, and it didn’t look out-of-place on the countertop where it was at its most useful. Once full, unlike our current composting pedal bin, the box was folded shut and walked straight out to the compost, instead of spilling out on to the floor which seems to happen in our kitchen more than I like to admit. 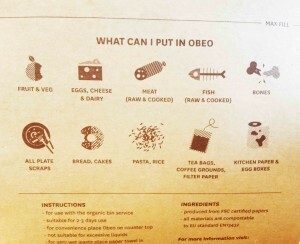 As soon as I’d used my second bag I was onto OBEO®’s website looking for replacements. 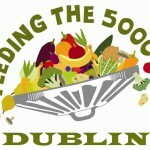 They run a handy, online shop for bulk buying (great for business’ who are trying to green up but struggling with the food segregation waste or anyone overseas) and after a tweet to @weareobeo, I was told that many Dunnes Stores and SuperValu stock smaller quantities for us regular shoppers, offering them at an RRP of €3.85 for a pack of 5, which OBEO® suggest is two weeks worth of bags. 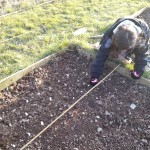 I’m really impressed with this simple yet innovative product. If you haven’t come across their answer to food waste recycling, take a look at the OBEO® website for more information and tips on reducing food waste in general. If you haven’t started composting, it’s something I’d recommend for everyone as apart from offering the opportunity for FREE soil conditioner, just thinking about food waste in general could save you over €1,000 a year – enough for a summer break! 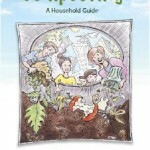 Here’s a handy downloadable PDF that explains how to compost that can help to get you started. Have you found a way of saving food waste that eliminates smells and untidiness or might OBEO® be the answer to your dreams too?